What if you grew up with a seal mother and a human father? Fionnuala is such a daughter – a part-human, part-seal Deaf woman who grows up with her father in Ireland, falls in love with another woman in India, struggles with her own identity while living in Italy, and finally discovers herself within a place of her own being and a world of her own choosing. 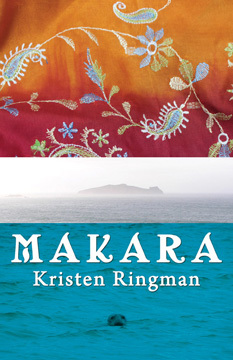 She’s the main character in MAKARA – a new book written by first-time novelist Kristen Ringman, and published by Handtype Press. But MAKARA…is much more than its plot. It’s a unique environment. Ringman’s smalltown Irish setting, her lovingly detailed portrait of India, and her romantic vision of Venice remain separate places bounded by plot points, but they also meld seamlessly into an emotional landscape…The concepts of fantasy and reality are similarly mashed up and reimagined into an atmosphere where anything is possible and the commonplace is as rare as a faerie circle. I just recently received my own copy of the book, and plan to put aside some time this weekend to sit down with a glass of wine and read it. Somehow, I think I’m going to enjoy it as much as Jerry and other reviewers have. Congratulations to Kristen and Raymond, and I wish you both the best of success!